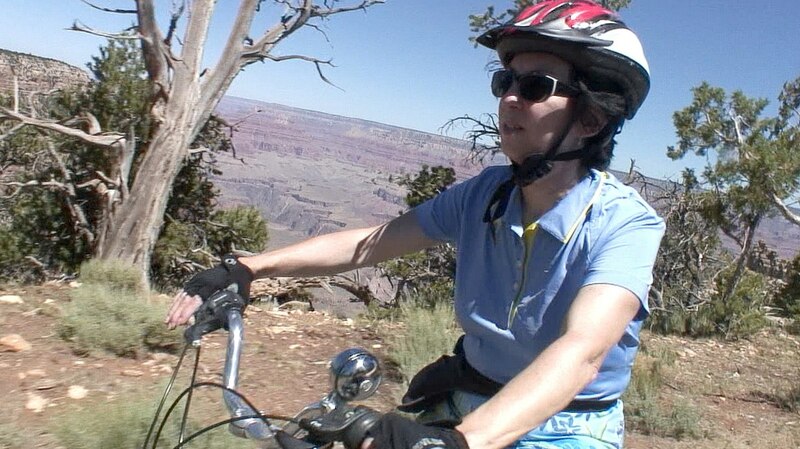 but the day we cycled to Hermit’s Rest at the western-most limit of the bike trail, we came face to face with one of the Common Ravens. It was perched in close proximity to the gift shop and shaded patio where visitors were enjoying snacks and lunches. The Raven was apparently hoping for a handout. 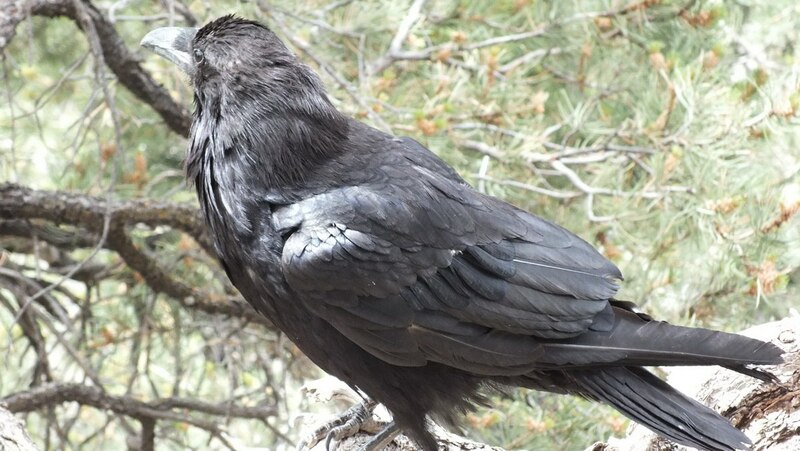 Seen from a distance, you wouldn’t guess that the Common Raven is one of the largest members of the corvids (Crow Family). 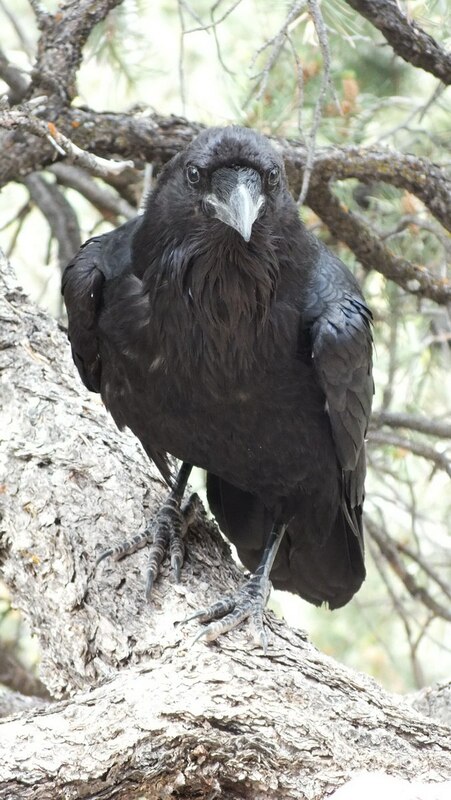 A mature Raven has a length of between 20-30 inches, and a wingspan of between 40-59 inches. 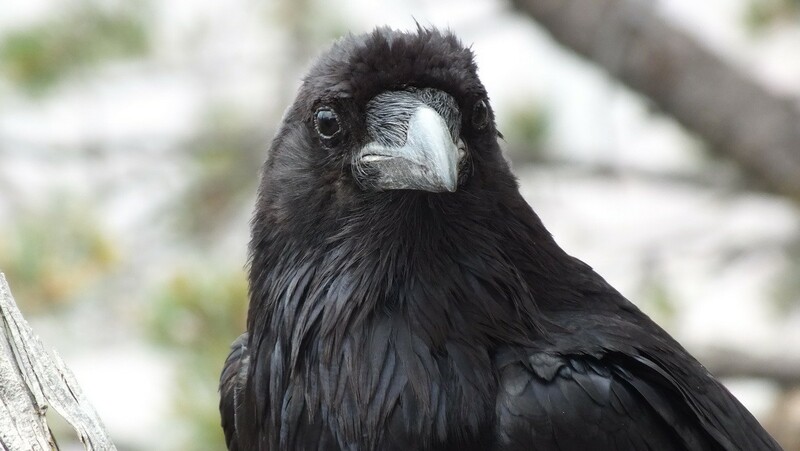 The Common Ravens are also referred to as Northern Ravens, and as one would suspect, they are found all across the Northern Hemisphere. 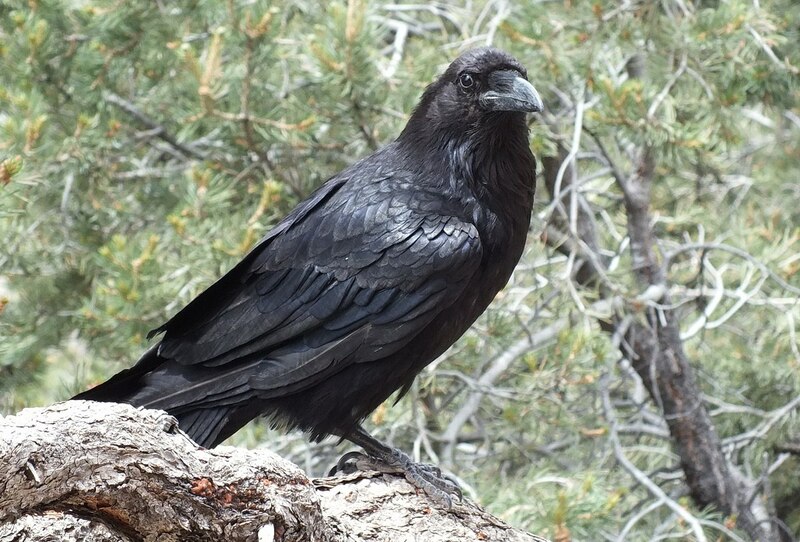 Common Ravens thrive in a wide variety of habitats – evergreen and deciduous forests ranging between coastal and alpine areas, tundra, grasslands, high-altitude desert, and sagebrush ecosystems. Their range includes the Arctic, islands in the Pacific Ocean and even Mount Everest. 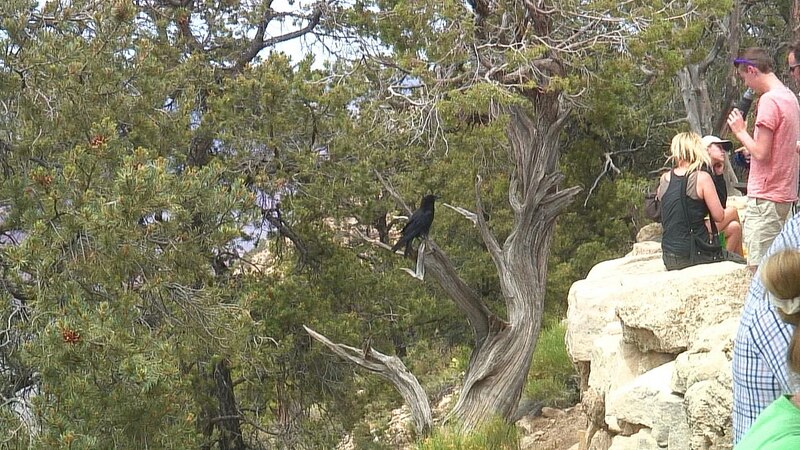 Ravens are very adaptable. 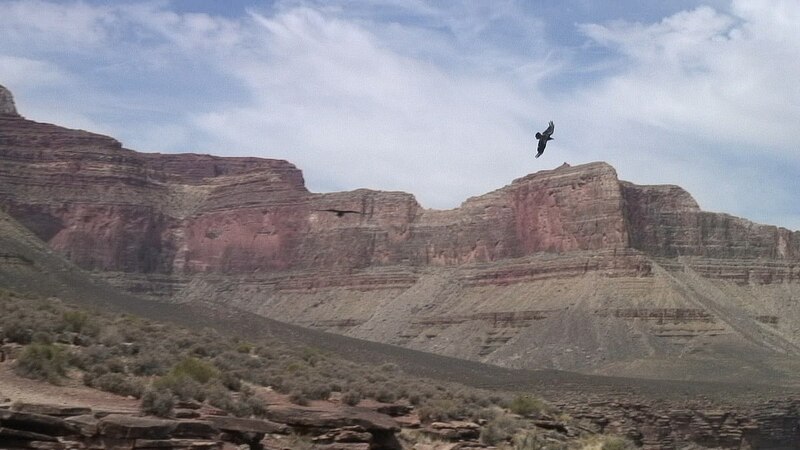 We loved having the opportunity to study this Raven at such close range. It was possible to get a really good look at the thick, shaggy feathers around the bird’s throat, its long and slightly curved beak, as well as the nasal bristles that cover the nostrils and a portion of the bill. 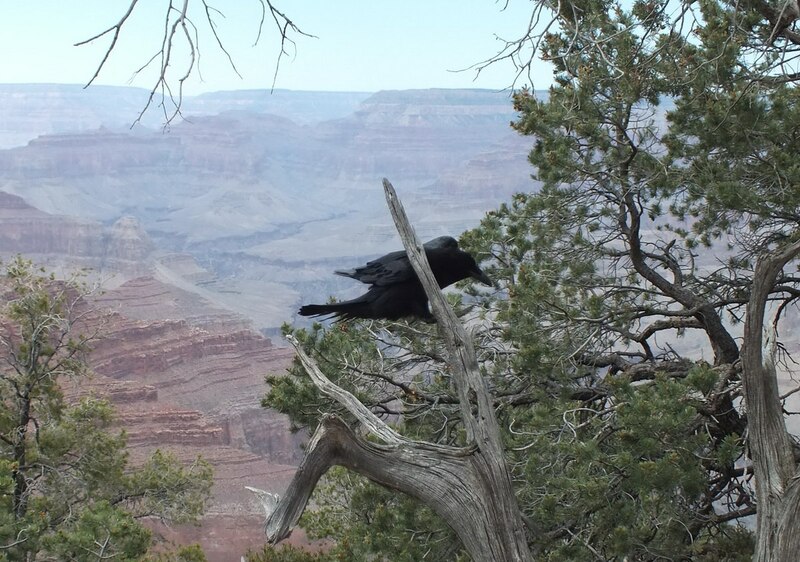 All the while, the Raven kept as keen an eye on the passersby as we kept on it. Like Ravens for centuries, this one was quite at home in the company of humans. 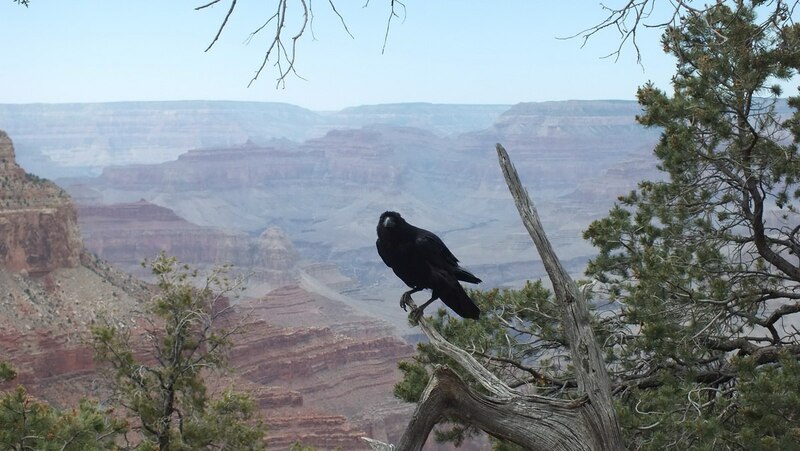 From its perch, the Raven had a wonderful view of the Grand Canyon, which may have served it well considering no one was yielding to the temptation to provide the bird with tidbits. Ravens are omnivores, meaning that they will eat almost anything. Its elevated position there at Hermit’s Rest gave the bird an advantage when scanning the sheer cliffs for small animals or insects. Ravens are very opportunistic and extremely versatile so they will also eat carrion, grains, fruit, berries and food waste. With the sun shining brightly on the Raven, by times a purplish sheen glinted from the otherwise glossy black plumage. Everything about a Raven is black: its long, heavy bill, sturdy legs and feet, even its eyes, all combining to give the bird a commanding appearance. It is common for Bob and me to see Ravens at home in Ontario, although I often have trouble distinguishing them from Crows, which are also quite large black birds. 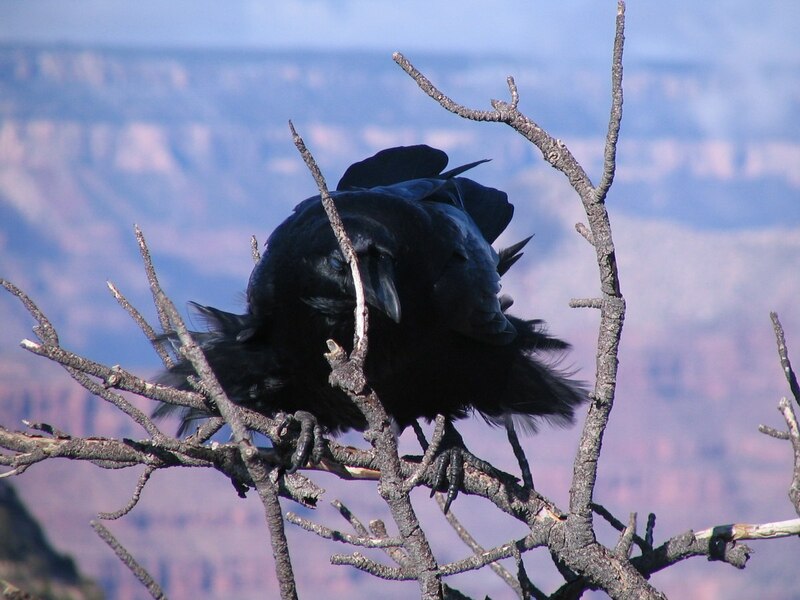 When in flight, a Raven’s long, wedge-shaped tail is more pronounced, and it flies with easy, graceful wingbeats. 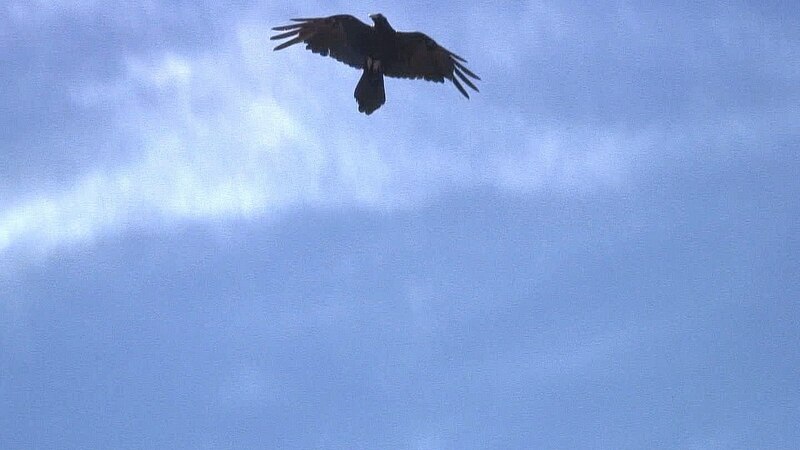 A Raven’s long wings have distinctive “fingers” at the tips; these are longer and thinner than those on a Crow’s wings. If you are ever close enough to hear a Raven’s wings in motion, you will notice a creaking sound emanating from the feathers. Coupled with their deep, gurgling croak from high overhead, and they become a little easier to differentiate from a Crow. Bob and I took time at Hermit’s Rest for just that, a short rest and a break out of the sun, and all the while, we were enthralled with the attentions of the Common Raven. Its eye didn’t stray far from the people, many of whom recognized the bird because of its association with ancient mythology, folklore, and religion. 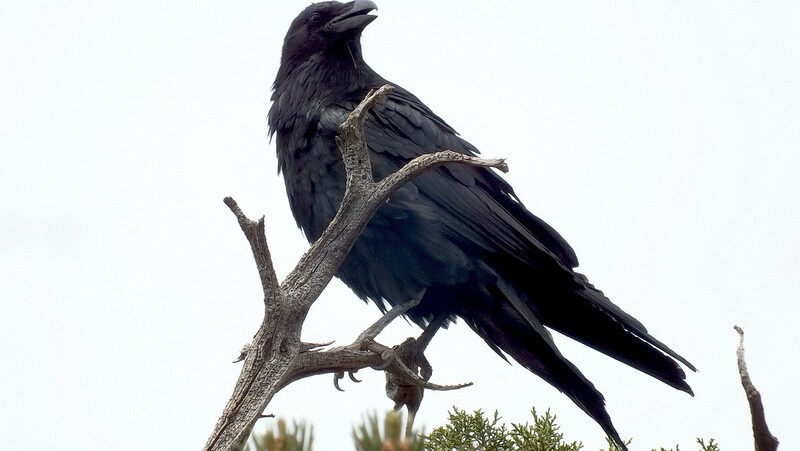 Their reputation arose because Ravens are extremely intelligent birds. They often work in pairs to achieve an end result, can put together cause and effect, and use logic when problem solving. To quote one Mark Pavelka of the United States Fish and Wildlife Service, “with other animals you can usually throw out 90 percent of the stories you hear about them as exaggerations. With ravens, it’s the opposite. 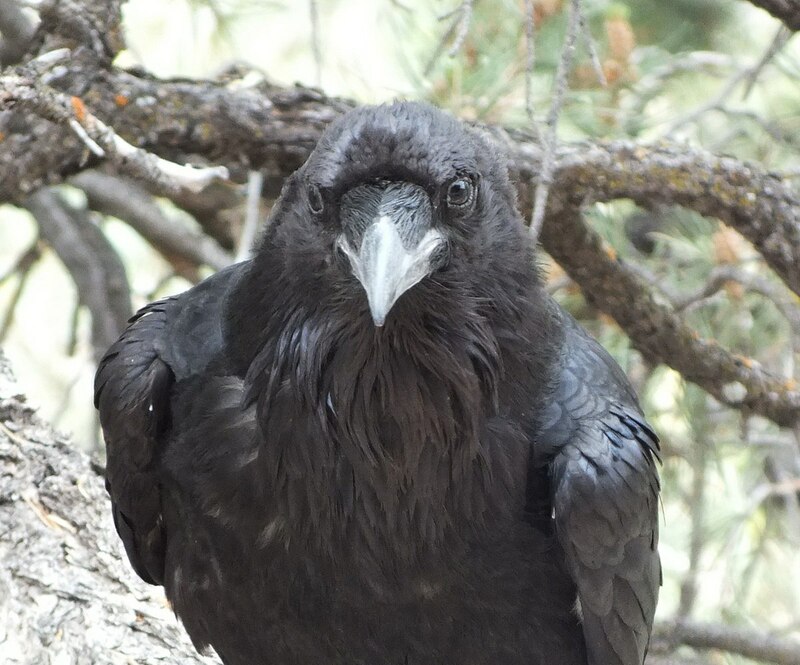 No matter how strange or amazing the story, chances are pretty good that at least some raven somewhere actually did that.” Bob and I felt honoured to be in this Common Raven’s presence. They are amazing birds.